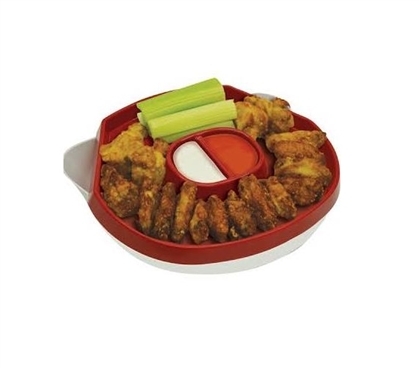 Perfect serving tray when eating pizza and wings with friends! Dorm Co. Tip: Platter is perfect for hiding chicken wing bones while eating! Dimensions: 12.5" x 10.56" x 3"
Sometimes the best dorm items are small. Our College Hide-Away Platter is one of those items! Chicken wings are a difficult item to eat, especially in college. You have your plate of chicken wings, you eat one and stick the bones on your plate, then before you know it you have no room to eat more chicken wings because your plate has been taken over by bones! Our College Hide-Away Platter is perfect for chicken wing lovers and is a dorm item that will be perfect even after college! The serving platter can hold over a dozen chicken wings plus two dips. The platter is also perfect for veggies or even chips and dip! Under the platter there is a hidden tray for the chicken wing bones so that your plate doesn't get taken over by bones. This college supply is a dorm essential for watching the Super Bowl, hanging out and eating with friends! 12.5" x 10.56" x 3"